Interactive and fun! Canada’s natural history museum is located in a beautiful castle in downtown Ottawa. 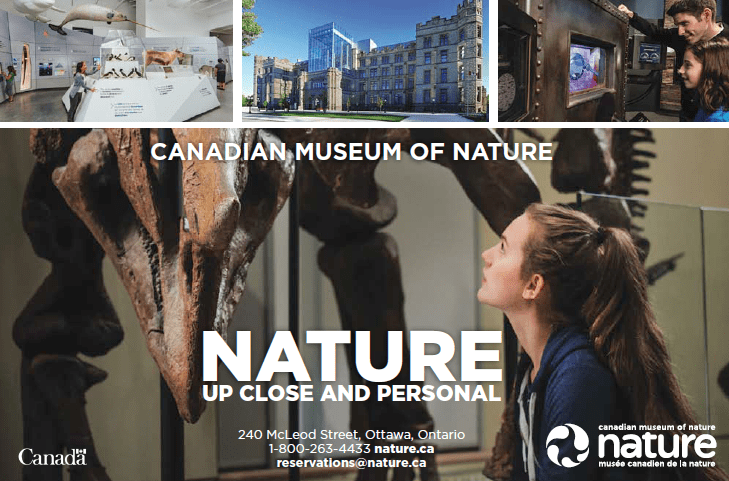 Five floors of galleries include dinosaurs, a blue whale skeleton, iconic Canadian mammals, dazzling minerals and gemstones, Canadian birds, and much more! Immerse yourself in the new Canada Goose Arctic Gallery, an Ontario Signature Experience! Curriculum-based workshops (K-12), on a variety of nature topics, are offered from October through June. New Gallery Exploration: Water experience available early 2019. New Sustainable Ecosystems: Arctic workshop for secondary students. Do-It-Yourself and Guided Tours available year round. Compare and contrast polar and grizzly bears in the new Hands-On Polar Bear Tour! Add an eye-popping 3D movie or special exhibition to your visit!